Two weeks ago, the third and final debate between presidential hopefuls Donald Trump and Secretary of State Hillary Clinton aired to a captivated audience at The Ainsworth Midtown. But the crowd may have been more captivated by the Burgers being served than the actual debate. Chef Stephen Yen prepared six candidate-themed Burgers to celebrate the night, and the top two ordered Burgers won spots on The Ainsworth menu. 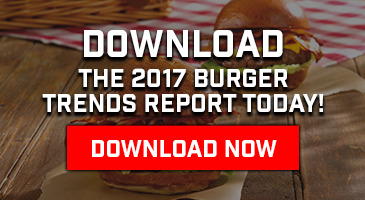 One of those Burgers, inspired by Donald Trump, was The Wall. Topped with fresh avocado slices, pico de gallo, and cojita cheese, this Burger was the second-most-ordered Burger of the night. Chef Yen shared the recipe with us so you could make this Burger at home! 1. Rub your Burger with Chili Lime seasoning and cook to order (medium rare is the way to go to bring out the most flavor and provide a juicy bite). 2. 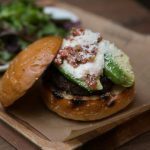 Place Burger on Brioche Bun and top with Fresh Avocado slices, Pico de Gallo, a generous sprinkling of Cojita cheese, and a dollop of Fresh Crema.